I bought a new car today! Ron and I spent a lot of time over the last two weekends looking at various cars on many different lots. 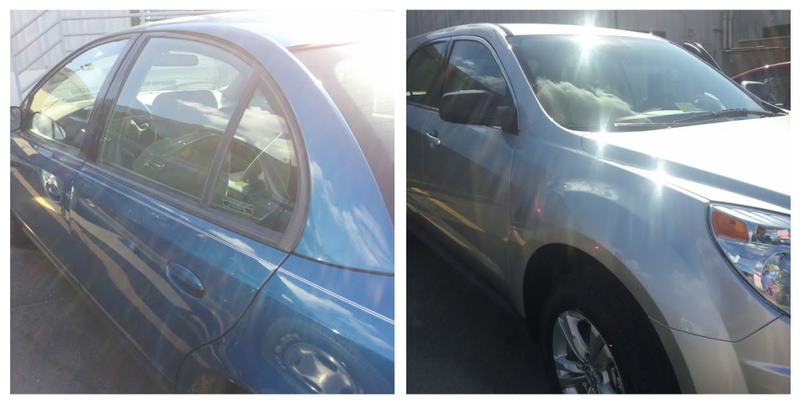 We were very interested in the Chevrolet Equinox, but thought we couldn’t get it in our price range. They were ordering some new ones in, and one would be the lower model version, so we decided to check it out when it came in. Then, it didn’t come in when we thought it would so yesterday we found a really nice Jeep that we liked. However, I couldn’t get the Equinox off my mind and the seller, Julius, was so nice right from the beginning. When I woke up this morning and told Ron I wasn’t sold on the Jeep, he was less than happy, mostly because of my inability to make a decision. We called the dealership and left a message letting the seller know we might want to look at something else. Fast forward an hour or two. We are leaving breakfast, headed to get gas, and there goes the truck with the Equinox on it heading for the dealership. We headed there as well, after enough time to not look totally sketch like we were stalking the truck, and after five hours of work, we were able to get the Equinox in our price range and bought it. So exciting. I’m glad I won’t have to worry about breaking down anymore. And I really appreciate all the help we received from Julius, especially when so many other sellers were not nice. It’s so wonderful to be able to go on the lot and be treated well–not like we’re too young, or stupid, or unworthy of owning anything nice. We work really hard so its nice to have something to show for it. Now all of that said, I was really sad to see my Saturn go. I will absolutely miss it, enough with all the trouble it has had lately. I feel bad, like maybe its at the dealership cold, lonely and scared. I know that’s weird, but I absolutely get attached to inanimate objects. I always feel like they have feelings too. When I was younger, I would make sure my stuffed animals were all tucked under the covers so they would stay warm. I can’t help it, I feel bad about trading the Saturn. It’s been a great car and I have had it for so long. I’ll really miss it. I hope it ends up at a good home with a good family who will appreciate it as much as I have.